I believe that art allows one the freedom to see differently and the possibility to enjoy a place through the eye of the artist is something special. I know many of the galleries, the secrete little places that other artist use as inspiration, the stories of an particular area, history of the building and to place them in a context which is not always written about in books. There are still little magic places to get a beer, to see locals and interact with the city in a close and comfortable way. I will show a simple way to know the city layout, so that you are not lost, and to be able to get a long with out being lost, and if being lost is your choice, to not feel that all is lost. 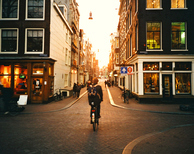 I love the size of Amsterdam, its very approachable and fun to navigate. The thing I like least about my city is lost tourist that get in the way of the bike lanes, go to all the same places and make a mess. I think that the best place to go is where ever I am comfortable. I dont have a place in particular or a specific thing I want to see, I want to go some where where the climate suits my cloths. laughter, adventure,beer,books,art,and the ability to see differently. Fresh bread, coffee,chocolate, and the smell of the sun coming up.